The full moon of February is known as the wolf moon. Amateur astronomers have a love-hate relationship with the full moon. While beautiful to look at, the full moon also floods the night sky with natural "light pollution," dimming otherwise visible stars and especially the astronomers' favorite deep sky objects. The full moon of February, known as the Wolf Moon, will arrive Friday (Feb. 18). While some astronomers may opt to watch reruns of the space science TV show "Cosmos" when their precious deep sky targets are too faint to see, they are missing one of the special treats of astronomy: observing the full moon with only their eyes, or perhaps binoculars. Each full moon during the year has a traditional name in different human cultures. February's full moon is best known as the Wolf Moon among some Native American tribes. The Algonquian peoples of North America called it the Snow Moon. Other names are Hunger Moon, Storm Moon, and Candles Moon. In Hindi it is known as Magh Poornima. Its Sinhala (Buddhist) name is Navam Poya. The official time of the full moon this month is Feb. 18 at 8:36 Universal Time. The full moon takes place at exactly the same time everywhere in the world, but the local time depends on the time zone. For some people, the fact that the full moon has specific date and time (rather than an entire night) may be puzzling. But it's really all about geometry and moon mechanics. When the sun, Earth and moon – in that order – fall in a straight line, or as close to a straight line as they can get, the moon is full. Because the moon’s orbit is slightly tilted to the ecliptic, there is usually a slight kink in the lineup, and the Earth’s shadow passes above or below the moon. That's why there is not a lunar eclipse every month. This is also the only time in the month when the moon is exactly opposite the sun in Earth's sky. On this date, and this date only, the moon rises as the sun sets, shines all night long, and sets as the sun rises. Every other night in the month, there is at least a little time each night when the moon is not in the sky. By the same token, there is at least a bit of time when the moon is in the daytime sky. The rising full moon often appears large and has an orange or red hue. The large size is an optical illusion; the moon is always the same size no matter where it is in the sky. The color (except during a lunar eclipse) is just due to light being scattered in the Earth's atmosphere. It's amazing how much detail can be seen on the full moon with just the naked eye. Notice first the difference between the darker top half of the moon and the brighter bottom half, caused by the different reflecting power of the northern half's predominant lava plains (called "seas" by early astronomers) and the south's mountainous highlands. 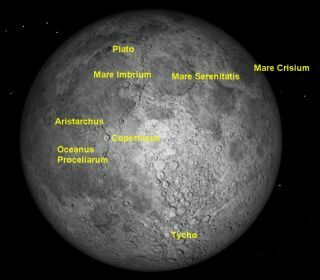 The top half of the moon is clearly divided into three major "seas": left to right (in the northern hemisphere) they are the Mare Imbrium, Mare Serenitatis and Mare Crisium. Those are the fanciful Latin names, which translate to: Sea of Rains, Sea of Serenity, and Sea of Crises. Two prominent craters mark the moon's equator: Aristarchus on the left and Copernicus towards the center. South of these is the Oceanus Procellarum, the Ocean of Storms. The brighter highlands that make up the southern half of the moon are dominated by the brilliant white crater Tycho and its complex system of rays. The asteroid that formed Tycho sent material flying in all directions in low orbit, only to be deposited on the darker underlying surface. Although the full moon is an instantaneous event, the moon looks full to the naked eye for a day or two on either side of the instant of full moon.